Effective States » At what point will we do something about inequality? Oxfam’s annual inequality report finds that extreme polarisation – the ownership of global assets by a tiny minority of the world’s population – has increased. 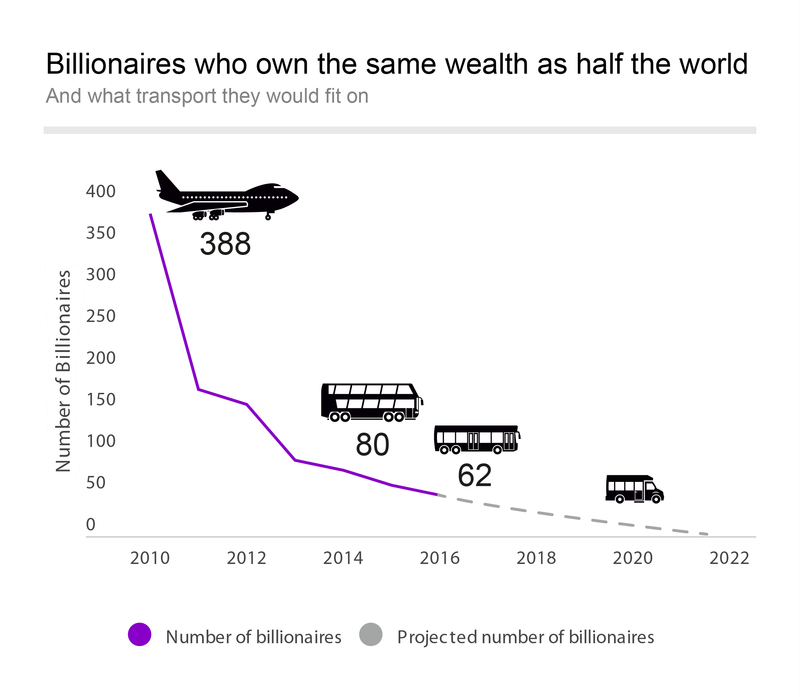 Now, only the 62 richest people in the world own the same value of assets as the 3.6 billion people in the bottom half of global incomes – surpassing Oxfam’s original prediction that by 2016, the wealth of the top 1 percent will equal the wealth of the remaining 99 percent. The Oxfam figures have been challenged, but they are based on the Credit Suisse Global Wealth Report , the best dataset available on present income and asset levels. Those inclined to the Left will argue that inequality is bad for humanity – it is unjust – and instrumentally it leads to negative outcomes for society as a whole. It may come as surprise to some people, but both the poor and the rich suffer from the wrongs of inequality. As Wilkinson and Pickett have shown in The Spirit Level, in virtually every aspect of life (physical and mental health, education, decent work and even life satisfaction) rising inequality in rich nations is associated with lower levels of social indicators. Those inclined to the Right will refute such arguments. 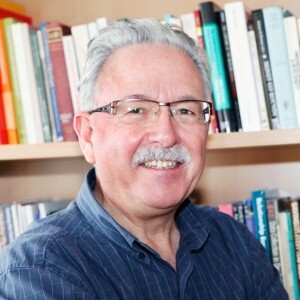 Economists will cite Art Okun, whose book Equality and Efficiency: The Big Trade-Off persuaded many (especially in the US) that efforts to reduce inequality lead to reductions in efficiency that constrain enterprise and economic growth. Such ideas informed leaders such as Reagan and Thatcher and fed the belief that ‘greed is good’. Inequality, it was argued, spurs people to make greater efforts and fuels competition. But it’s not just the Left declaiming inequality. IMF researchers recently concluded that: “… it would still be a mistake to focus on growth and let inequality take care of itself … because the resulting growth may be low and unstable … redistribution, and the associate reduction in inequality, is thus associated with higher and more durable growth”. The IMF identifies a “tentative consensus … that inequality can undermine progress in health and education, cause investment-reducing political and economic instability, and undercut the social consensus required to adjust in the face of shocks … it tends to reduce the pace and durability of growth”. Warren Buffett, the world’s most successful investor, has pointed out that the share of income tax he paid the US Internal Revenue Service was lower than the clerical staff in his office: “How can this be right? … There’s class warfare, all right … but it’s my class, the rich class, that’s making war and we’re winning”. Whatever your view point, it’s undeniable that inequality is rising at spectacular rates. While different measures (wealth or income), different datasets (national accounts or taxation) and different analysts disagree on the detail, they all agree that the wealthiest are getting richer faster than anyone else (except in Latin America). 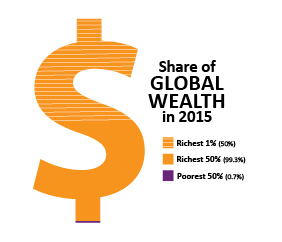 The real income of the global top 1 percent rose by more than 60 percent over 1988-2008. The reasons for such growth in inequality are complex, but two factors stand out. First, contemporary capitalism is based on economic processes that permit those who manage to amass money by their brain power or political connections, or both, to increase their wealth faster than others. As Thomas Piketty tells us – the returns to capital (owning physical and financial assets) are greater than the returns to labour (working), as is the historical record for all but a part of the 20th century. So the rich get richer. But, there is also a political economic reason. Those with so much wealth are able to shape national and international public policies so much that they can ensure that they get wealthier. They can ensure that national and international patent and competition laws allow them to dominate the markets in which they operate and that taxation laws allow them to avoid paying tax. By gaining control of the media, plutocrats can even persuade the public that inequality is good for everyone. One solution is effective public expenditure on domestically-financed education, health and social protection, which raises the prospects for sustained growth, structural transformation and welfare advances. The evidence for such policies is clear, but enacting them in the places they are most needed is very problematic. The nature of domestic business and political elites – often greedy, extractive and predatory – allied to international business elites and the social norms they transmit, means that socially beneficial policies are not effectively implemented. The power of the “1 percent” may appear unassailable. Will we have to wait for a miracle? For businesses and entrepreneurs to obey regulation in ways that do not undermine domestic revenue mobilisation? For governments to promote broad-based growth, prosperity for all and welfare … and for that plutocracy can be replaced by democracy? Or, will a growing tide of protest and its consequences (sometimes socially progressive and sometimes regressive, as in Egypt) persuade the 1 percent that they will not get the world they want for their grandchildren if they continue to promote inequality as a global social norm? Want to debate this view point? Come along to the Global Development Institute launch on 17 February and hear Winnie Byanyima, Oxfam Executive Director, deliver a keynote lecture on inequality and the future of global development.